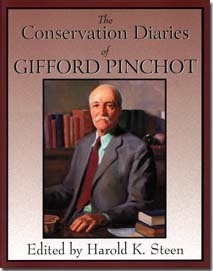 Diary entries of conservationist and forester Gifford Pinchot (1865-1946), describing his work as the first chief of the United States Forest Service, his relationship with President Teddy Roosevelt, his influence on forest policies and politics, and his interaction with prominent contemporaries such as botanist Charles Sargent, preservationist John Muir, and landscape architect Frederick Law Olmsted. Forest History Society, 2001. 230 pp. Ill., names index.